Negotiation has rightly been called the highest hourly-rate work in the world. Sometimes you can, in a matter of seconds, make (or save) tens or hundreds of thousands of dollars through negotiation. At other times, by chipping away at a deal over months, you can literally create a bargain that richly rewards your patience and effort. It’s worth taking any negotiation seriously and preparing for it. It’s worth consciously building your negotiation skills. So true. By learning to control your reactions, and watching your language, you can make a fortune. Or save it. 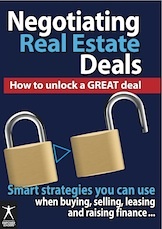 This new book Negotiating Real Estate Deals – How to unlock a GREAT deal is based on proven material and the experience of masters in the area of property deals and negotiation — see ’What’s covered’ below. ’Negotiating Real Estate Deals – How to unlock a GREAT deal’ will give you valuable and useful pointers — tips for your own successful negotiations. It’s about learning how to get MUCH BETTER results than before. With the advice contained in this book, you can hopefully dodge some of the most expensive and painful mistakes — ones that have caught others out and taught them lessons which they can share with you. You can learn how you can add value to the deal so that it goes smoothly and you get what you want. #1 this is not a book teaching you how to rip people off. It’s not about teaching you how to find the soft white underbelly of distressed vendors, or people in trouble and exploit them. [You don’t need to do that to get a bargain, trust me.]. #2 it’s NOT our aim to load you up with a bunch of insincere glib phrases or ’tricks’ or to hypnotise you to become a ’clone’ of someone else. We have a saying: Be yourself. It’s who you do best. Negotiating Real Estate Deals – How to unlock a GREAT deal is about learning skills and information that will make a difference to your deals — buying, selling, leasing raising finance — and much more. It’s about HOW to work the negotiation so you get the best deal you can. Not only that, what you learn are transferrable skills — things you learn in one context can be useful to you in another. You can look at real estate investing as a game … but it isn’t gambling. It also isn’t about ’get rich quick’ — that said, I have personally, no bull, made tens of thousands of dollars of instant equity by buying property well — through negotation. And there are many others I’m sure who have done far better than me. So, if you see property investing as a game, negotiating is one of the key skills players must learn — the skills are vital, because a mistake can cost you serious money — and doing it right can literally (not figuratively) make you a fortune. Order this eBook now at the special price of just $54.95 (normal price: $64.95) and receive the audio programme (MP3 files) How to Negotiate from a ’Position of POWER’ by Paul Vujnovich FREE of charge. PLEASE ORDER YOUR COPY BELOW. What’s covered? If you’re interested, and want to know more, have a look through to ’What’s covered’ and read about some of what you can learn from this new eBook … learning HOW TO DO IT BETTER from people with genuine experience.